Whatsapp Tutorial | Whatsapp for Blackberry, Android, iPhone Application | Descargar | Free Pc to Phone Calls, Free Voip Calls to India International ! Mobile text messaging is something which has become essential part of our life now. Chatting with friends on PC is getting old and what's favorable is chatting or texting on mobile. Off course you are charged by your telecom provider for text sms. And if the friend to whom you want to send SMS is in another country, then you will be charged heavily for international messages. Getting all this for free is the best deal you can get : and yes this is all possible with Whatsapp Messenger! I guess many our of blog readers may already be using Whatsapp Messenger. Please note that the application became so popular that Facebook has purchased this application for a whooping $19 billion. But the ones who have not used Whatsapp messenger then just read on. This new application completely replaces the conventional method of sending SMS. Whatsapp Messenger enables you to message international text free of charge on smartphones using internet facility, your data plan! Whats best about Whatsapp is that its a cross platform based instant messenger client for mobile phone. Whatsapp Messenger is for your Blackberry, Android, iPad, iPhone, Android Tab and even available for Nokia Mobiles. Whatsapp application is available for all these devices. Because WhatsApp Messenger uses the same internet data plan that you use for email and web browsing, there is no cost to message and stay in touch with your friends. And yes I have been using Whatsapp on my Android Mobile, trust me its awesome. Infact I have installed Whatsapp on my computer as well, so in short I am chatting with my friends all the time. How is Whatsapp different from regular SMS service ? SMS service usually have limitation of 160 characters per message (depending upon the carrier). Whatsapp has no such limit. SMS messages route through your regular telecom provider, no internet connectivity required to use SMS service. Whatsapp messages are routed through data plan basically it uses internet connectivity. You will be charged for sending SMS (per SMS basis). Whatsapp messages are free! How is Whatsapp different from Gtalk, Yahoo Messenger, or other IM! All the messenger services require you to add contacts, they have the concepts of being online when sending messages. Though free, but many lack group chat or broadcasting messages! More about Whatsapp : You just need to install the app. No need to add any contacts. All those your phone contacts (yes your mobile contacts) who have whatsapp installed on their phone will automatically be shown in your Whatsapp buddy list. Its so simple that you just need to install it, rest you will know automatically. Connecting of Whatsapp is based on phone numbers just like SMS messaging. Another good thing about Whatsapp is that just like SMS message, you can send the message even if your friend is offline. Message will be sent to server and it will get delivered when your friend gets online. On which mobiles (Smartphones) does Whatsapp work ? WhatsApp Messenger is available for iPhone, BlackBerry, Android and Nokia and yes, those phones can all message each other. Whatsapp for iPhone: Download Link : It can be used on iPhone. To use Whatsapp on iPhone you need iOS 3.1 or later. Regarding using Whatsapp on iPad and iPhone touch, we will blog soon. Whatsapp for Nokia: It works on Nokia S60 3rd edition, 5th edition or Symbian3 Operating System. Whatsapp for Android: Download Link : Donut and above it works : Android OS 2.1 or above! Works great on Froyo. Whatsapp for BlackBerry: Download Link : It works on BlackBerry OS 4.5 or above with BlackBerry Internet Service or BLackBerry Enterprise Service. Whatsapp for Windows Mobile : Download Link : Whatsapp application can work on windows based mobiles as well. So if you are having Nokia Lumia phones, you should be able to use this app to send free messages. - Group Chat with Whatsapp Messenger : You on your Android, your friends using Whatsapp on their iPhone, Blackberry, Nokia! - Broadcast Message : Send a joke to a list of friends! - Multimedia Message for Free : Send Video, Images, and Voice notes to your friends and contacts. 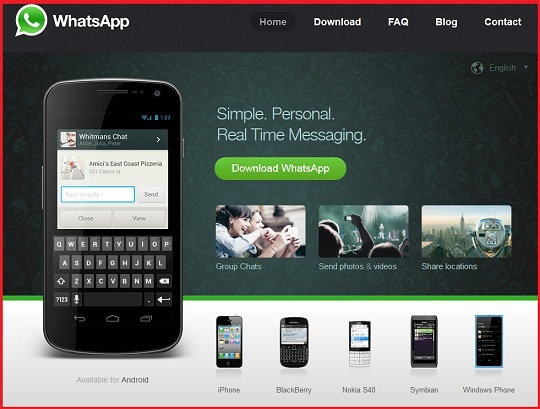 - Free Whatsapp Service : One year free. After first year, a nominal charges of about $0.99-$1.99/per year. But yes, first year free. - No charges for SMS : No charges for messages, it just uses data plan connectivity! Basically you just require data (internet) plan on your phone. Works with Wifi! - No Usernames required : Contacts added based on mobile number. No need for you to add any contacts, the process is automated. - Status : Just like other IM! - Offline Messages : Does not require to remain connected to internet all the time. Its time for you to try Whatsapp on your mobile. If you are facing any problems regarding whatsapp, any questions regarding Whatsapp : just share in the comment section. We will try to answer them all! Hey, my name is Sunit. i really liked the information you've shared about whatsapp. My question is - How can i store a friend's mobile number who lives in the USA and uses whatsapp? How can i start chatting with my friend from there? Do i need to put a certain code before his number while saving it on the phone? You do not have to do anything extra to chat with this friend. All you need to do is simply save his contact number in your phone and that's it. He will be automatically visible in your Whatsapp contact list as well. Now chat with him.